The UK produces around 100 million tonnes of rubbish a year. To put that into perspective, that's enough rubbish to fill the Albert Hall every two hours! In fact, you throw away your body weight about once every seven weeks. That's a lot of rubbish. And that's why today we're taking a look at how you can reduce the amount of rubbish that you produce. The good news is that with a little forethought, this is dead simple! We need to look at both the big and the small picture here. On a large scale, it's important that we reduce the amount of rubbish we produce because of the environment. Creating landfills to fill with our trash and burning rubbish has a huge environmental impact. And the truth is that each year we produce on average 3% more rubbish than the year before, so the situation isn't getting any better. Of course, with council recycling programmes there have been some improvements. For example, in 2003 the energy produced from recycling glass alone was enough to power ten space shuttle missions! But even with these small improvements, it's still important that we cut down the amount of trash we're producing. On a small scale, cutting down the amount of rubbish produced by your household has a personal impact too. That might be as simple as having to take out the rubbish less often (which is always good! ), or not overloading your bins every week. But it can also mean saving money, since many rubbish reducing strategies will actually cost you less. That being said, let's take a look at ways you can reduce the amount of rubbish you throw away. One of the simplest ways to reduce the amount of rubbish you make is to make it more convenient to recycle. If you separate rubbish at the source, you'll find that it's easier to recycle than it is to throw away. That means keeping separate recycling containers wherever there's a “rubbish hub.” For most people that's the kitchen at the very least, but you might also want to consider keeping at least paper recycling bins in other places too, like your home office or the living room. Around 20% of the average household's waste is made up of paper and card, both of which can be recycled. 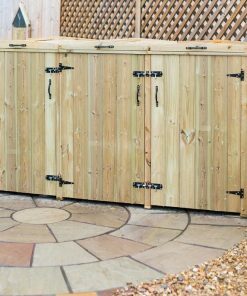 Composting might have an iffy reputation, but if done properly, it doesn't have to stink, or even take up much room. In fact, you don't even have to have a garden to compost. 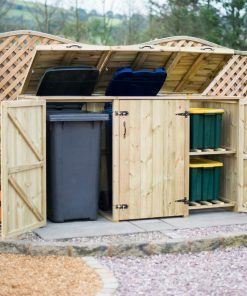 There are plenty of small, inside composters for sale online, or if you do have a garden you can set one up there. Around 40% of the rubbish that goes into landfills each year is actually compostable, so this stands to cut down on a lot of your household rubbish. Compost is for anything organic, so all those food scraps can go in there, which has the added benefit of making your bins smell better and stay cleaner. Exactly how many plastic shopping bags do you have lurking around your house? And how many do you throw away? A plastic bag takes about a century to break down in landfill, and we throw away hundreds of thousands of these a year. Plus, given that nearly all supermarkets now charge for plastic bags, it makes financial sense to carry your own bags anyway. Invest in some lightweight, easy to carry mesh or fabric bags and ditch the plastic bags altogether. You'll save the environment and money too. Food packaging and take out containers make up a large percentage of household rubbish, and the truth is that these are fairly unnecessary. If you're heading out for some take out, take your own containers with you, no one will mind, and it'll be easier to store leftovers in the fridge too. And try buying food without the packaging. No, seriously. Buying loose vegetables, rather than prepackaged is often cheaper and healthier anyway, since they're likely to be fresher. In cases where you don't have much choice, such as with frozen foods, then choose the product with minimal packaging, and remember that cardboard and paper are better choices than plastic. Some areas now even have special supermarkets where everything is unpackaged, and you take your own containers for your groceries, and again, these tend to be cheaper than traditional supermarket options. If you've got the time then making things yourself is a great option. Home made bread tastes great, is healthier than supermarket versions, and comes without the plastic packaging too. And buying second hand not only means you buy products without packaging, but also means that you save cash. This is especially true for things that you're not likely to use every day (like that bread making machine…). Reducing your rubbish is great for the environment, but it's great for your wallet too in most cases. And most of these tips are as easy as remembering what you're supposed to do, no special skills or purchases necessary!